We’re happy to bring you news about a new fan project for Heroes VII, Wryn Pendragon: Umbramancer. It is an ambitious expansion to the game, started by the Czech Heroes community at worldofheroes.cz. 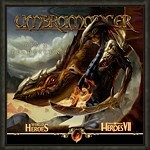 Featuring a brand new world with new story, maps, units and heroes, Umbramancer is looking to be the most comprehensive Heroes VII mod project to date. Wryn Pendragon: Umbramancer is being developed mainly in Czech language, but the project is also being translated in English. The expansion includes a new custom faction, and majority of the new units have already been announced. You can find more information and videos about the new creatures from the project website. The developers are also looking for people to help with the project, including model building, scripting, sound and map design. We’ll be following the project closely here at HoMMdb, so stay tuned for more updates.